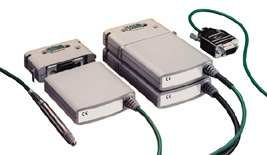 OMEGA's LDN232 adaptor provides easy connection of GP901 digital gage probes to any device with a full duplex RS232 serial port, such as a computer or PLC. Up to 31 sensors, in any combination, can be connected to a single serial port. Connections are simplified by use of the LDN-CON connector. These ingenious devices can be used individually, daisy-chained using standard computer cable, or plugged together to form multi-channel nests. A free software package includes drivers for DOS as well as example programs, with source code, for popular programming languages. A demonstration program is included showing outputs in numerical and column display format.